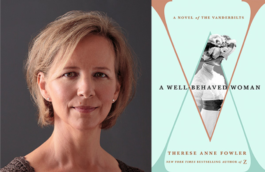 Open Book: Will Lightning Strike Therese Anne Fowler Twice? The name Vanderbilt carries a huge weight, conjuring images of mansions, robber barons, and even, in the 20th century, denim jeans. Most of us might be able to pull up “Cornelius” and more of us “Gloria,” but what do we really know about this huge and influential American family? Therese Anne Fowler came up against this as she was looking for a follow-up to her massive 2013 bestseller, Z: A Novel of Zelda Fitzgerald. She faced the inevitable author dilemma: what next?